One in three online teens have experienced online harassment. Girls are more likely to be victims, but most teens say that they are more likely to be bullied offline than online. About one third (32%) of all teenagers who use the internet say they have been targets of a range of annoying and potentially menacing online activities – such as receiving threatening messages; having their private emails or text messages forwarded without consent; having an embarrassing picture posted without permission; or having rumors about them spread online. Depending on the circumstances, these harassing or “cyberbullying” behaviors may be truly threatening, merely annoying or relatively benign. But several patterns are clear: girls are more likely than boys to be targets; and teens who share their identities and thoughts online are more likely to be targets than are those who lead less active online lives. Of all the online harassment asked about, the greatest number of teens told us that they had had a private communication forwarded or publicly posted without their permission. One in 6 teens (15%) told us someone had forwarded or posted communication they assumed was private. 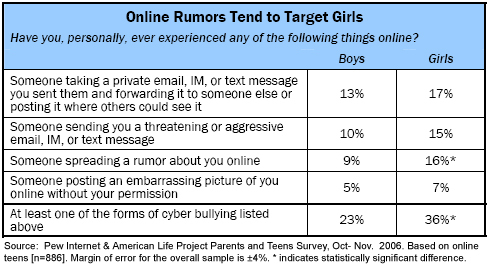 About 13% of teens told us that someone had spread a rumor about them online, and another 13% said that someone had sent them a threatening or aggressive email, IM or text message. 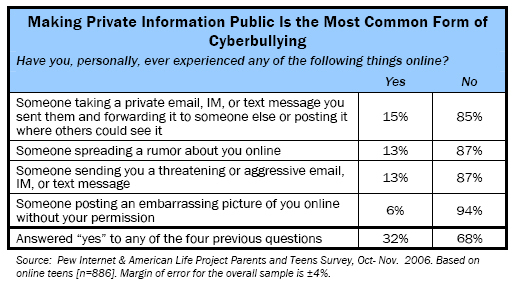 Some 6% of online teens told us that someone had posted an embarrassing picture of them without their permission. Yet when asked where they thought bullying happened most often to teens their age, the majority of teens, 67%, said that bullying and harassment happens more offline than online. Less than one in three teens (29%) said that they thought that bullying was more likely to happen online, and three percent said they thought it happened both online and offline equally. These results come from a nationally-representative phone survey of 935 teenagers by the Pew Internet & American Life Project. Girls are more likely than boys to say that they have ever experienced cyberbullying – 38% of online girls report being bullied, compared with 26% of online boys. Older girls in particular are more likely to report being bullied than any other age and gender group, with 41% of online girls ages 15 to 17 reporting these experiences. Teens who use social network sites like MySpace and Facebook and teens who use the internet daily are also more likely to say that they have been cyberbullied. Nearly 4 in 10 social network users (39%) have been cyberbullied in someway, compared with 22% of online teens who do not use social networks. The most commonly experienced bullying is having someone take a private email, IM or text message and forwarding it on to someone else or posting the communication publicly. Nearly 1 in 6 (15%) of online teens said they had experienced unwanted forwarding of private communication. Older teens (ages 15-17) say they are more likely to have had someone forward or publicly post private messages – 18% of older teens have experienced this, compared with 11% of younger teens. Girls are more likely to report someone spreading rumors about them than boys, with 16% of girls reporting rumor-spreading compared with 9% of boys. Social network users are more likely than those who do not use social networks to report that someone had spread a rumor about them (16% vs. 8%). Older teens, particularly 15- to 17-year-old girls, are more like to report that they have received a threatening email or message. Overall, 9% of online teens ages 12-14 say they have been threatened via email, IM or text, while 16% of online teens ages 15-17 report similar harassment. Among older girls, 19% have received threatening or aggressive email, IMs or text messages. Social network users are more likely than those who do not use social networks to report that someone had sent them a threatening or aggressive email (16% vs. 8%). Online teens who have created content for the internet – for instance, by authoring blogs, uploading photos, sharing artwork or helping others build websites – are more likely to report cyberbullying and harassment than their peers. Content creators are also more likely to use social networks – places to create and display and receive feedback on content creations, and social network users are also more likely to be cyberbullied. Two-thirds of all teens (67%) said that bullying and harassment happens more offline than online. Fewer than one in three teens (29%) said that they thought that bullying was more likely to happen online, and 3% said they thought it happened both online and offline equally. Girls are a bit more likely than boys to say that bullying happens more online (33% of girls vs. 25% of boys), though overall, both boys and girls say that kids their age are more likely to be harassed offline. White teens are bit more likely than African-American teens to think that bullying is more of a problem online – 32% of white teens said bullying happens more often online, while 18% of African-American teens said the same. 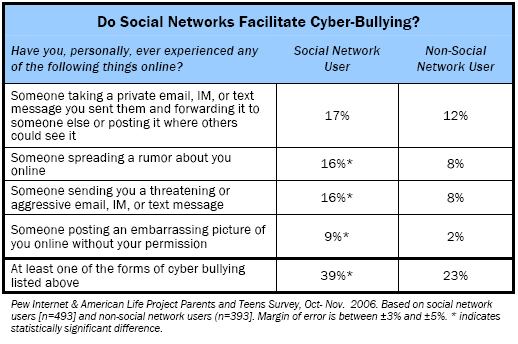 Teens who have online profiles are just as likely as those who do not to say that bullying happens more often offline. Teen who have been cyberbullied are more likely than their peers who have not been bullied to say that they believe bullying happens online more than offline. However, the majority of bullied teens say that bullying is more likely to happen offline than online. More than 7 in 10 (71%) of teens who have not experienced bullying believe it happens more often offline, while 57% of teens who have been cyberbullied themselves say bullying happens more offline. Why do teens bully online? Bullying has entered the digital age. The impulses behind it are the same, but the effect is magnified. In the past, the materials of bullying would have been whispered, shouted or passed around. Now, with a few clicks, a photo, video or a conversation can be shared with hundreds via email or millions through a website, online profile or blog posting.